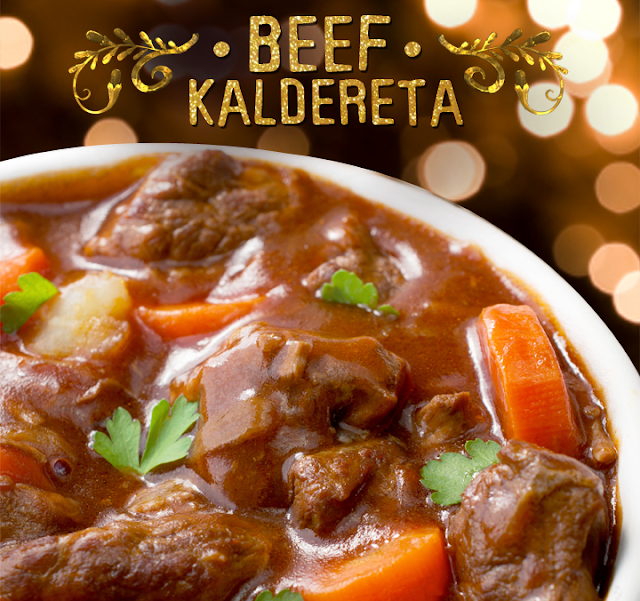 Caldereta, also spelled as Kaldereta, is a beef stew and considered a comfort food due to its rich ingredients and spicy taste. The stew is very popular in Philippines, mainly on the Luzon island, and has been around for a very long time. The dish is simple to prepare and does not take very long. Over the years, the dish has become a staple at every fiesta and a common household preparation. The dish is also served commonly at the local Filipino turo-turo places, otherwise known as the point-point joints. 1. Heat the cooking oil in the cooking pot. 2. Saute the onion and garlic. Add the beef and the soy sauce and cook for 5 minutes or until the color turns to light brown. 3. Add the dried bay leaves and crush pepper. Stir. 4. Add the liver spread. Stir. 5. Pour in the tomato sauce and beef broth. 6. Cook the beef until it becomes tender (about 30 minutes if using a pressure cooker, or 1 to 2 hours if using an ordinary pot). 7. Add potatoes and carrots. Cook for 8 to 10 minutes. 8. Put the green olives and bell peppers in the cooking pot. Stir and continue to cook for 5 minutes more. 9. Add salt and pepper to taste. Serve hot and Enjoy!